For Kit Kat’s 16th Birthday, I put a little Pinterest inspiration into action and made this cake. It tasted as good as it looked, and since I had lots of requests, I wanted to share how I made it. As always, I am not creative enough to come up with the original idea, but I am great at copying others – probably the main reason I love Pinterest so much! The Cake Recipe – I used THIS recipe except I used boiling water instead of coffee. Most of you like coffee and will probably enjoy the recipe as it is printed. Assembly – Once the cakes were cooled, I placed parchment paper onto a plate and stacked the cake layers together on top of the parchment. I then pulled the excess parchment up around the sides and wrapped the outside of the cake in a towel using THIS technique. It’s basically a way to assemble the layers without an extra frosting layer. I only had the cake in the freezer about 3 hours before taking it out to begin decorating. Frosting – Amanda at iambaker is pretty much the hero of this whole cake, including the frosting. 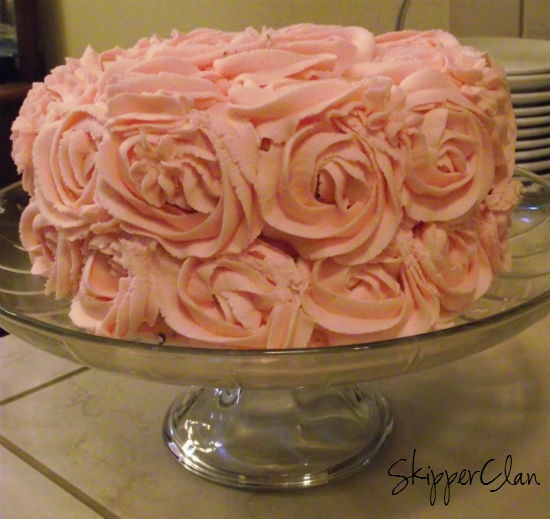 I have been making buttercream like this for years but she is the first person I’ve seen share that she makes hers with 1/2 Crisco – 1/2 butter like I do! HERE is her recipe for the frosting. I added about 4 drops of red food coloring at the end to get the pink color. This is the point in the process where I feel like I have a true appreciation of my KitchenAid stand mixer. It stays on the counter all the time cause that’s how often I use it. Decorating – The video tutorial Amanda shares in THIS blog post is hands down the best way to see how to get the floral technique to work for you. I did not have the decorating tip she used, but mine said 2D and it worked great. I loved her technique of putting the metal tip in one bag, and inserting a bag of frosting inside that. If any of you have tried to get the couplers apart after using frosting bags, you understand the genius of using them this way. So, there you go. I plan to use this cake as my potluck cake from now on. Even with white frosting it will be beautiful. Let me know if you give it a try. Lovely cake! I think you’re right, it would look elegant in white too. I think for potlucks I will simply do it in a sheet cake, a small piece is more than enough because it is so rich. thank you! It is *very* sweet! Gorgeous! I’ve never seen the idea of stacking the cakes without the extra frosting between. Love that! Leave a Reply to Megan@positivelyimperfect.com Click here to cancel reply.